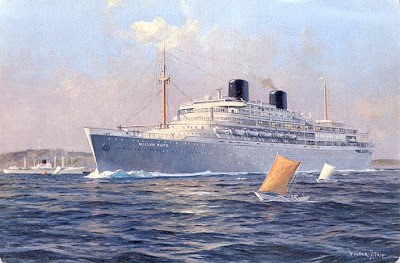 One of the most viewed "posts" on this blog is "WILLEM RUYS becomes ACHILLE LAURO", this ship is also one of my favourite liners of all time, throughout the years I have collected many photos, brochures and literature about this exquisite lady, known as "LA NAVE BLU" or "THE BLUE SHIP" so I have decided to add a few more words here as a tribute to this beautiful former liner which was part of my life for nearly twenty years, I have fond memories of seeing her in Portugal, Spain and Italy a ship with a very distinctive and handsome profile. 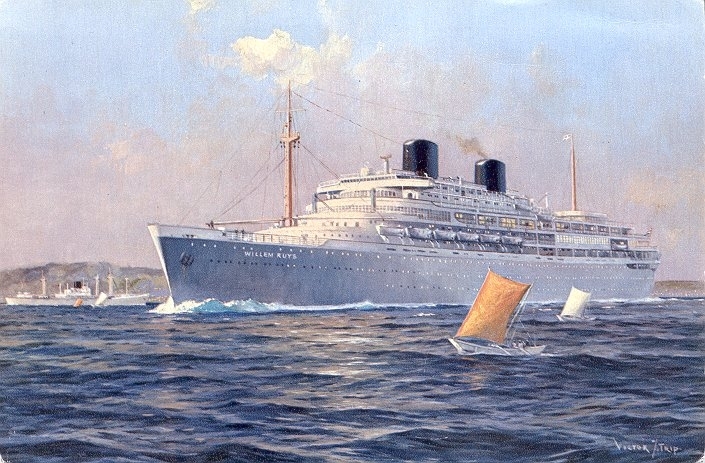 "ACHILLE LAURO" was for many Maritime Historians and ships enthusiasts the most well known passenger ship of the post-war age, second only to the QE2, not so much because of her graceful lines but rather because of her 1985 hijacking and many incidents she suffered during her life, culminating with her loss by fire in 1994. 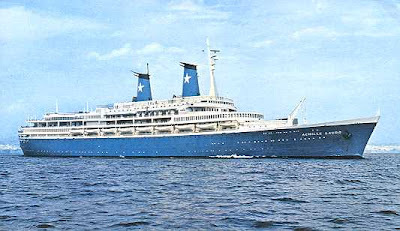 All started back in 1946 when she was launched as the WILLEM RUYS to be operated by ROTTERDAM LLOYD on the HOLLAND-DUTCH INDIES route, she was at the time of her building the largest passenger ship of the company and would also become their last liner, she was when completed the highest powered diesel ship in the world with a maximum output of 30.000 bhp, she sailed from 1947 to 1964 more than 1.8 million nautical miles, she was named in honour of a chairman of ROTTERDAM LLOYD murdered by the Gestapo in 1942. 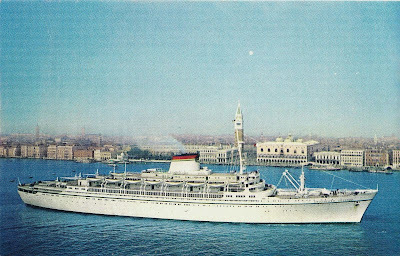 WILLEM RUYS was handed over to FLOTTA LAURO in January of 1965, during her rebuilding process, which was extensive as the photos below document, she was badly damaged by fire at Palermo, she survived and embarked on her maiden voyage from Genova to Sydney in April of 1966, her last voyage as a liner was in October of 1972 when she sailed from Southampton, another fire damaged the ship five months earlier during an overhaul. ACHILLE LAURO started her new role as a full-time cruise ship in April of 1973, two years later she collided with a Lebanese ship off the Dardanelles. Due to bankruptcy of LAURO the ship was arrested at Tenerife in 1982, she remained there for about three months but eventually sailed back to Genova but was kept laid-up until 1984. 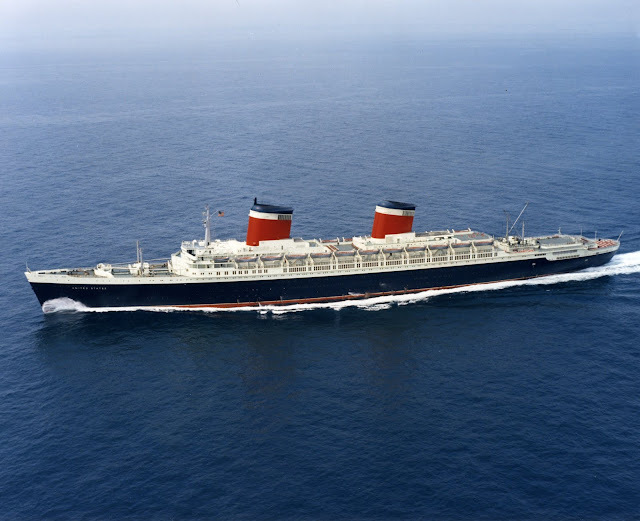 It was in 1985 that ACHILLE LAURO made World headlines when she was hijacked during a cruise, she was travelling from Alexandria to Port Said when she was taken over on the 7th of October, one American passenger was shot and thrown overboard, captain Geraldo De Rosa became an hero when he offered himself ahead of any other passenger hostages, after tense negotiations the hijackers surrendered and the ship docked safely at Port Said on the 9th of October of 1985. 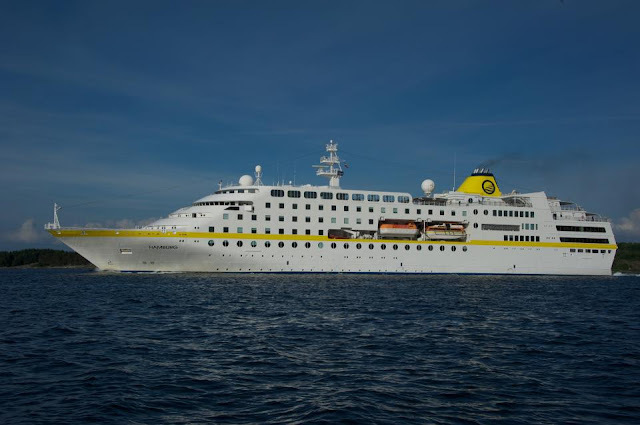 The hijacking of ACHILLE LAURO devastated the cruise Industry in the Med where many cruises were simply cancelled due to lack of passengers, the "BLUE SHIP" defiant, once more continued to operate all her scheduled cruises. 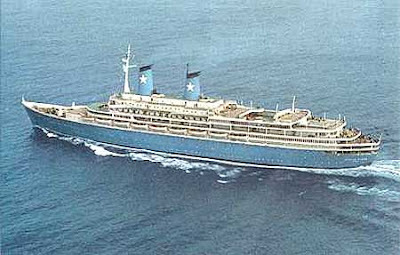 the ACHILLE LAURO was known worldwide as a "lucky ship", after all she survided fires, collisions, running aground, but on the 2sd of December of 1994 the "lucky ship" was no more when she foundered off the Somalia coast due to a massive fire that broke up two days earlier in the engine room, the end of a remarkable career, but a place in history. Postcards above from my collection, photo of the WILLEM RUYS, copyright ROTTERDAMSCHE LLOYD MUSEUM.